LONDON (AFP) – London's main airports Heathrow and Gatwick reopened Monday after being forced to close by the volcanic ash cloud, but airports in Northern Ireland and others around Britain remained shut. 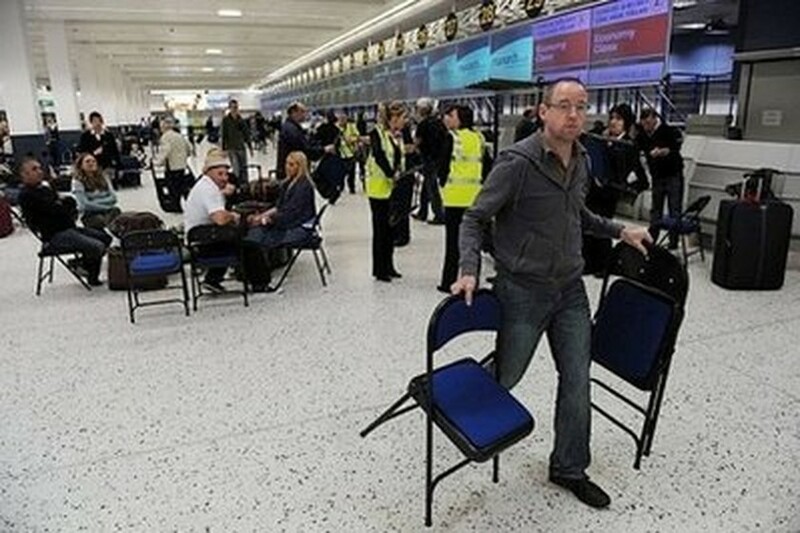 Heathrow, Europe's busiest airport, reopened at 07:00 am (0600 GMT) as did Gatwick. However restrictions remained on flights because of their proximity to a dense section of the shifting ash cloud from a volcano in Iceland. Airports inside the no-fly zone were shut until 1200 GMT with all airports in Northern Ireland and the Isle of Man to remain closed until then. Scotland's busiest airport, Edinburgh, plus Aberdeen and Inverness were closed while Wales's main airport Cardiff was shut, as was Swansea. In England, Bristol in the southwest and Farnborough, southwest of London, were also closed until 1200 GMT. In the Netherlands meanwhile, the authorities announced the closure of the airports in Amsterdam and Rotterdam from 6:00 am (0400 GMT) to 2:00 pm Monday. The latest ash closures came at the beginning of a week where air travel disruption was already expected due to a five-day strike by British Airways cabin crew set to kick off Tuesday. Europe's skies were partially closed for up to a week in April following the eruption of Iceland's Eyjafjoell volcano, in the biggest shutdown of the continent's airspace for more than 50 years. Experts fear the volcanic ash can damage jet engines and create a serious risk of a crash. "There is slightly increased activity for the past two days, there has been some ash fall around the glacier," Bjoern Oddsson a University of Iceland vulcanologist told AFP. "The column (of smoke) has increased and rises up to eight kilometres (five miles)," as opposed to six kilometres in previous days. But its effect on European flights depended entirely on the winds, he added. NATS also ordered the closure of several smaller airports around London and southeast England early Monday. But they allowed restrictions to be lifted in northern and central England, from 0000 GMT after the ash cloud drifted south and away from their airspace. That allowed Manchester Airport, the busiest outside London and among the 20 busiest in Europe, to reopen after several hours' closure Sunday. Birmingham, Liverpool, and Leeds-Bradford also reopened. In Scotland, as Prestwick prepared to reopen Aberdeen Airport, further northeast, was set to close. Airports in the Western Isles and along Scotland's west coast remained shut. Earlier, aviation regulators in the Republic of Ireland extended a closure of Dublin airport by three hours to at least 1100 GMT Monday. The airport closed at 1800 GMT Sunday. The other two main airports, Cork and Shannon, remain open until further notice, the Irish Aviation Authority (IAA) said. Of the smaller hubs, Donegal was to remain closed until at least 1100 GMT, while Ireland West (Knock) and Sligo were to reopen at 0800 GMT. Kerry is open until further notice, while Galway and Waterford would reopen at 0500 GMT Monday. North Atlantic flights crossing Irish airspace would not be affected, said the IAA. The latest shutdowns drew renewed attacks from the aviation industry, which has been hard hit by the ash cloud chaos. The international airline industry body, IATA, has estimated last month's shutdown cost carriers some 1.7 billion dollars (1.4 billion euros, 0.7 billion pounds). Virgin Atlantic boss Richard Branson branded Sunday's closure of Manchester Airport as "beyond a joke". "We need strong leadership to intervene to avoid doing further unnecessary damage to the UK economy and lives of travellers," he said. Eurostar, which runs high-speed rail services linking London with Paris and Brussels via the Channel Tunnel, said it was laying on extra trains between the capitals Monday to answer an expected surge in demand.